The American retail giant, Walmart, has removed items with Soviet symbolism from its website after protests from many European politicians. The merchandise, bearing the hammer and sickle symbol, was being sold on the Walmart website by a third-party company, not the retail giant itself. However, after a number of protests from many politicians and Baltic expat representatives abroad, Walmart decided to remove the items that, for many people, seemed offensive towards the millions of victims of communism. In a letter to the Latvian member of the European Parliament, professor Inese Valdere, Walmart said, “we have decided to remove the items” bearing the Soviet symbolism. The company added that these items “were never listed by Walmart or sold in stores”. Politicians of Estonia, Latvia and Lithuania had sent a public letter to Walmart a few days before. A number of politicians, especially from Estonia, Latvia and Lithuania – the three countries that were occupied by the Soviet Union and saw decades of communist terror, including murder and deportations – protested against the sale of items bearing Soviet symbolism on the Walmart website. “We are disappointed that the largest retailer in the world and in the U.S., Walmart, does not acknowledge or respect the millions of victims of various nationalities, who suffered under the Soviet regime – those deported, including the elderly, infants and children, political prisoners, dissidents, members of resistance movements and all those who lost their lives, health or family in the Gulag or other repressions of the Soviet totalitarianism,” a letter to Walmart, signed by the chairman of the Estonian Pro Patria party, Helir-Valdor Seeder, Estonia’s minister of justice, Urmas Reinsalu, and the Estonian member of the European Parliament, Tunne Kelam, said. Walmart is an American multinational retail corporation that operates a chain of hypermarkets, discount department stores, and grocery stores. It’s the world’s largest company by revenue – over USD500 billion – and it operates in 28 countries. The company allows third-party operators sell their merchandise on its website – that’s how the items bearing Soviet symbolism ended up on the Walmart website. 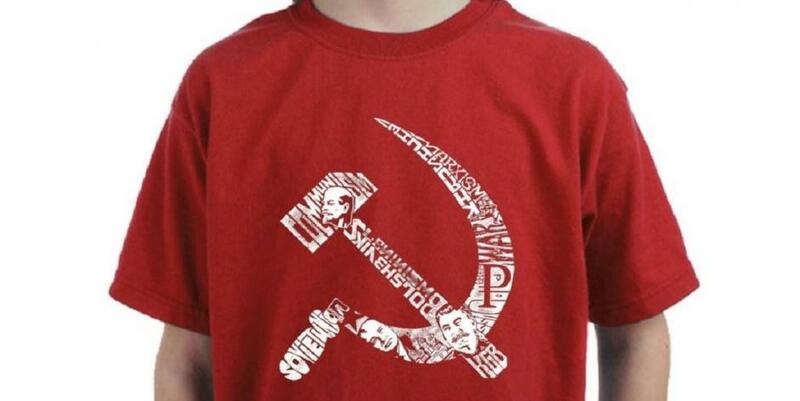 Cover: Soviet-themed T-shirt, previously sold on the Walmart website.